Chicago-based Ensemble Dal Niente has been showered with critical praise and prestigious awards since forming in 2004. Their astonishing virtuosity is put entirely in the service of musical communication, making even the most demanding contemporary works accessible and compelling. 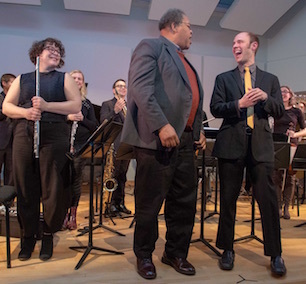 Their program for NMNC featured pieces by George Lewis, Anthony Braxton, Katherine Young, and Anthony Cheung that, while notated, each have origins in improvisation. 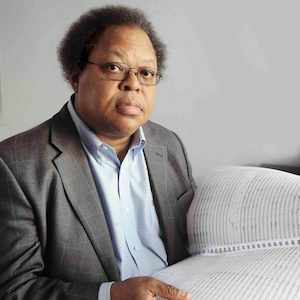 Composer and MacArthur (“Genius Grant”) Fellow George Lewis, who holds a PhD in Humane Letters (honoris causa) from New College, joined us for this concert. As a Special Event, NMNC in collaboration with the Ringling Museum's Art After 5 program presented a series of improvisations in the Ringling's galleries the Thursday before our concert. Starting at 5, there was one solo (soprano) near the Visitor's Pavilion, then two more solos (flute and bass clarinet ) at 5:30 and 6 in the main Museum galleries (rooms 19 and 20). At 6:30 in Gallery 21 the ensemble performed George Lewis's Artificial Life 2007, followed by a talk/discussion with Lewis. The ensemble's name, Dal Niente (“from nothing” in Italian), is a tribute to Helmut Lachenmann's Dal niente (Interieur III), the revolutionary style of which serves as an inspiration for its musicians. The name also references its humble beginnings -- founded in 2004 by a group of student composers at Northwestern University, the ensemble has risen from obscurity to a position as one of North America's most prominent new music groups. 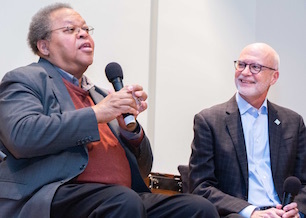 George Lewis studied composition with Muhal Richard Abrams at the AACM School of Music, and trombone with Dean Hey. A member of the Association for the Advancement of Creative Musicians (AACM) since 1971, Lewis's work in electronic and computer music, computer-based multimedia installations, and notated and improvisative forms is documented on more than 150 recordings. In May of 2017 Lewis gave New College's commencement address and was awarded the degree of Doctor of Humane Letters, honoris causa, from the college. He is the Edwin H. Case Professor of American Music at Columbia University. A Fellow of the American Academy of Arts and Sciences and a Corresponding Fellow of the British Academy, Lewis’s other honors include a MacArthur Fellowship (2002), a Guggenheim Fellowship (2015), a United States Artists Walker Fellowship (2011), an Alpert Award in the Arts (1999), and fellowships from the National Endowment for the Arts. New! Watch video of every piece in the concert, below!